After some frigid temperatures around and below zero degrees Fahrenheit earlier in the week, daily highs are once again hovering around the freezing mark. This equates to a bit of small scale freezing and thawing — especially noticeable on roads and sidewalks throughout the day; our big snowdrifts, however, still remain. It will take warmer temperatures than we’ve seen here in the first few days of March to promote any significant melting, but it doesn’t quite look like we’re going to get them in the next ten days. The forecast calls for high temperatures in the mid-30’s for most of next week, and lows look to remain in the 20’s and maybe even 30’s on some nights. And, in case you thought that because it’s now March that we’re done with all the snowfall, there’s a chance of at least one more big winter storm for southern Minnesota beginning in the early part of next week. While the temperatures were a bit on the bitter side on Monday and Tuesday, the last few days have been rather pleasant, and thus many outdoor-goers have been taking advantage of the snow still present. Skiers and snowshoers have been common arboretum sightings in the latter part of this week as the trails right now are nearly perfect for both activities. 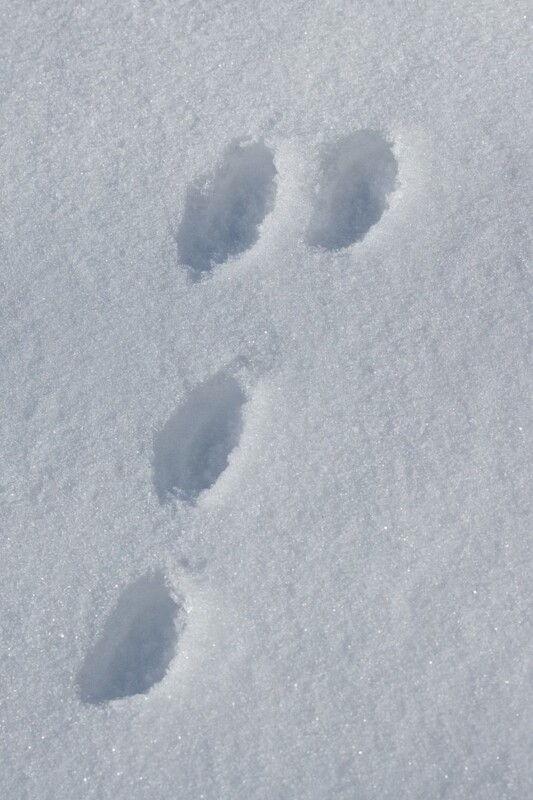 Some of the arboretum’s wildlife apparently agrees, as there has been a resurgence in both squirrel and rabbit foraging around the Interpretive Center, as evidenced by the animals’ footprints left in the snow. This increase in activity, in addition to some other sightings this week noted below, are surely a sign of the coming spring. Eastern Cottontail tracks behind Interpretive Center, 3/1/11.